By now everyone's seen The Matrix, right? What do you mean "What's The Matrix?" So let's explore exactly what's on these discs. This 10-DVD collection comes in two formats. The one I'm presently reviewing is a nicely-presented slip box incorporating five of the cardboard-type DVD cases and a detailed booklet describing by title the assembled features and breaking the films up into chapters. In case you've been in another galaxy for the last century, the first film in the trilogy has Neo discovering that what he thinks is the real world is in fact a computer program created by machines which have humans wired-up like batteries to power their vast city. The Matrix comes as an excellent 2-disc set. The first contains a new digital transfer of the film, a written intro by the writer/director Wachowski Brothers, and three new commentaries (one from philosophers Dr Cornel West and Ken Wilber, the other from critics Todd McCarthy of Variety, John Powers of Vogue and David Thomson, author of The New Biographical Dictionary of Film). 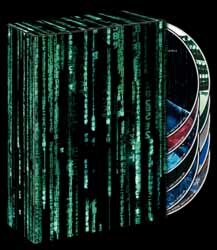 The second disc has a feature length documentary called The Matrix Revisited, 3-hours of audio music (made up of 41 tracks) called The Music Revisited, featurettes Behind The Matrix, and Take The Red Pill, Follow the White Rabbit (containing 17 featurettes originally linked in branching to the film, CD ROM material and Web Links). The Matrix Reloaded is also a 2-disc set. After an innovative, intelligent and thought-provoking first film, this one tries to be too clever and simply ends up complicating the situation. However, there is a number of outstanding set pieces and these alone are worth seeing the film for. The first disc contains The Matrix Reloaded film, with introductions and commentaries as per The Matrix. The second disc has Enter The Matrix (23 live action sequences shot for the video game, which tie-in with the overall structure of The Matrix trilogy) with Niobe and Ghost the main characters. There's also I'll Handle Them (Behind the scenes of The Great Hall sequence), The Exiles (explaining the backgrounds of the peripheral characters), Unplugged (the multiple Mr Smith fight), Teahouse Fight (where Neo is tested before seeing the Oracle), and Weblinks. The best section on this disc is Car Chase, wherein the Freeway Sequence is picked apart from concept to realisation. The motorcycle stunt woman is fearless, and the choreography and computer plotting is fascinating. The Matrix Revolutions is the third of the trilogy, a generally action-packed but messy conclusion where the accepted exaggeration of the first two films went a little too far. Again it's a 2-disc set for this one, with the movie and commentaries as per the first two films. Disc 2 is again packed with features. Crew explores set construction, artists, lighting and the 2nd film unit, Hel uncovers stunts, wire work, working extras, and explosive and physical effects. Siege describes making the machines a reality, computerising sequences, storyboarding the final scene of the Mifune character, constructing the IPU mechanical fighting machine, and the new actors for this film. Super Burly Brawl plots the shooting of the last fight scenes between Neo and Smith. New Blue World is about creating Zion, on-screen graphics, and constructing a fist fight in the real world. The Aftermath describes the music composition, shooting two films back to back and coding for cutting, sound effects, and rendering the visual effects. The Animatrix contains nine short films (see my review of last year) totalling 89 minutes, and bonus material on a single disc. There are director commentaries on four of the films. Scrolls to Screen is a nice documentary on the culture and history of Anime. Creators is a text feature on the directors and segment producers. There is also a short featurette on each of the short films. This is a great disc with some extremely diverse stories in terms of style and content. The final 3-disc section is called The Matrix Experience. The first disc is The Roots of The Matrix, an in-depth and surprisingly interesting documentary exploring the philosophies of the concepts covered in the trilogy. This disc also has another feature which investigates and theorises on the plausibility of the science behind the fiction. Disc 2 contains some of the best material in this set. A long documentary called The Burly Man Chronicles (apparently a working title for some of the shoot) covers a countdown in approximate days of the training, set building, computer rendering, planning, acting, filming and a thousand and one other tasks carried out, all in the name of making a movie (or two, as this covers the back to back films). Every area is viewed or covered in some way, but never lingers long enough to make you lose interest. Furthermore, there's 21 White Rabbit branching link featurettes with the documentary. This, more than any other feature I can think of, will astound you with just how much is involved in presenting fictional celluloid for our viewing pleasure. It is extremely big business. The Zion Archive, the final disc for this set, is the definite weak link here. Aside from semi-interesting concept artwork and storyboards, the majority of the rest comprises of TV spots and trailers for each film in the trilogy. The Rave Reel gives us music and computer imagery resembling a sophisticated Windows Media Player, and The Matrix Online shows and describes moments from the website game. So, a lot to get your teeth into then. This set is a Matrix fanatic's dream. There's certainly a lot of attention to detail. However, I'm obliged I think to reduce my marks by a point from 9 simply because this is not a mainstream release. You would have to eat, drink and sleep - in fact, live and breathe - The Matrix to fork-out for more than 35 hours of bonus material. Nice idea though.